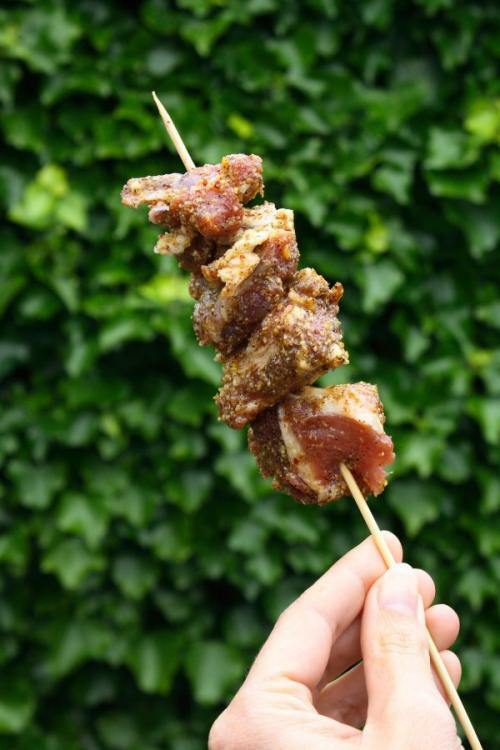 These skewers of lamb are perfect for the barbecue and make a good alternative to the normal barbecue standards of burnt sausages and undercooked chicken. They’re easy to make, and cook in just a few minutes. It’s better if the lamb is cooked slightly pink. The flavourings here are most definitely Indian, a heady mix of chilli, garlic, coriander, fenugreek and mustard. The intensity of the chilli can be tempered – just add less, but these are kebabs that should have a bit of life to them, so don’t go too easy. Start with a kilo of boned out lamb shoulder or leg, diced into cubes between two and four centimetres square. Dress the meat with a tablespoon of olive oil, mixing well. Crush or grind a couple of small, dried red chillis or a teaspoon or so of chilli flakes together with two teaspoons of coriander seeds and a teaspoon each of fenugreek seeds, mustard seeds and black peppercorns to form a fine powder. Add a teaspoon of salt. Add the spice mix to the meat, along with three cloves of finely chopped garlic and stir it in, so that the meat is covered in oil and spices. This can, and should, be done the night before. An extended stay in the fridge with the odd prod and stir will help the meat take on the flavour of the spices and will improve the finished kebabs no end. Two hours is the absolute minimum. To cook, spike the meat onto pre-soaked wooden skewers and place on the barbecue. Six or seven minutes should be more than enough, turning over half way through. The spices will have worked their way right through the meat, the kebabs charred by the heat of the grill, smoky and intense. A good relish would be perfect on the side.